Prize: 2 winners: 49” LG LED TV. ARV: $437. 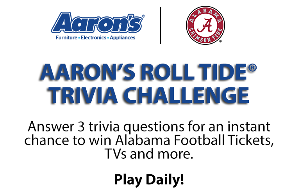 1 winner: Two Tickets to the Auburn Game on November 24th, 2018, 2-night hotel accommodations in Tuscaloosa, pregame hospitality passes and Alabama apparel. ARV: $800. 2 winners: Autographed Footballs. What you must do to enter: complete form -- answer 3 trivia questions (your answers don't matter).